Stillwater Cottage by Thomas Kinkade is available for sale on paper or canvas, framed or unframed at special discount prices. Select from the following authentic Thomas Kinkade editions: standard numbered, artist proof, gallery proof, examination proof, international proof, publisher proof, renaissance edition, studio proof, Atelier National edition, and masters edition. "Still waters run deep; the waters of this crystal pool offer a balm to the soul. Here, in this tranquil glade, God's perfect peace reigns. Publisher Proofs are small canvas editions reserved for Thomas Kinkade Galleries, Signature Dealers, and the Publisher. Publisher Proofs are designated with the letters P/P during the numbering process and include a back-stamp identifying it as a Publisher Proof. Each canvas is individually hand-numbered and hand-highlighted and includes a Certificate of Authenticity. 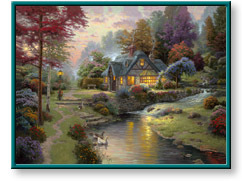 Stillwater Cottage painting by artist Thomas Kinkade (also spelled Thomas Kincade, Thomas Kincaid, or Thomas Kinkaid) can be purchased in art print or canvas form at special sale prices at Christ-Centered Art.